Yesterday, I took a whole day off from the computer. I didn't even turn it on. Instead, I sat by the fire and read A Little Princess to the kids. They loved it and when it was over, my six year old asked if there were any more books about Sara. She was sorry to hear that there were no more. My children love books that come in a series. If a story is a good one, they always want to know more. And so I've been thinking about some of our favorite book series to read aloud and read over and over again are and thought I'd share them with you all. We also like the Hardy boys, Three Investigators, Nancy Drew, Magic Treehouse, Prydain Chronicles, Narnia books and many others. What else do you recommend? Harry Potter. (And if that raises your eyebrows, then read them first and then read Looking for God in Harry Potter by John Granger). I've read all the Harry Potter books and loved them, but I'm not ready for the kids to read past #3 yet, even though all my nine year old's acquaintances have read the whole series. Arthur Ransom's Swallows and Amazons series. My husband introduced me to the Prydain Chronicles! Another one he liked was The Hero and the Crown and the Blue Sword(which is extra impressive since the main character is...gasp! a girl!). Not a long series, but might be up your alley. The Freddy the Pig series and Boxcar Children series are some of our faves. Babysitter's Club and Sweet Valley High. Awesome. (1) Today is Justin's birthday. For the next few months we will be the same age and then I will be the old lady again. Being older than my husband has never bothered me, although he has retained his youthful appearance better than I have. What does bother me much more is the fact that when we married, we were the same height and weight. We are still the same height, but I have had five children and he hasn't. Hmph. 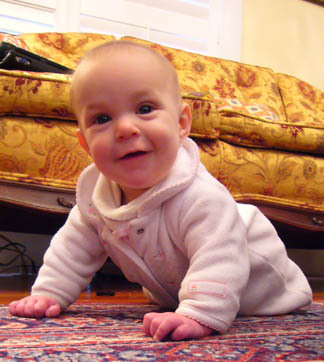 (2) The baby is crawling or lunging or something. It is hard to describe her method of locomotion, but suffice it to say, papers and other detritus that my children strew across the floor are no longer safe. It's also time for me to find some baby gates to block entrance to places we have not yet gotten doors for. (3) Had a nice "date" with my now older husband last night. After the kidlets were asleep in bed, we sat in the living room and read poetry to each other. Sounds cheesy, but we weren't sticking to the sappy stuff, just picking out interesting poems and reading them out loud. In fact, my volume was of comic verse. It would have been even better had we started a fire, but I didn't want to send Justin out into the cold, dark night to chop wood. (4) It's so warm in Nashville today though that I think the kids and I will be spending most of our time outside. I have a sudden longing to pull weeds and look at all the bulbs peeking their heads up out of the earth. I really want to buy everything in all the seed catalogs that come to my house, even though I'm lazy and hate starting things from seed. I can't wait to plant more stuff in both the flower beds and the veggie beds. But what I really need to do is clean up all the junk and kid debris in the yard. We're starting to look like rednecks. (5) Last week, I got to do something I never really thought I wanted to do, but I had a great time. I went to a Celine Dion concert. I admit I've never been a fan particularly, but when you are home with five children any chance to get out of the house is welcome. So when Mrs. Fussypants invited me to come along with her, Jamie and Jessica, I went. Thanks to Alli for asking me and for Barbara Jones at the One2One Network for the tickets. (6) A girl I was friends with in grade school 23 years ago found me on Facebook. I haven't thought about anyone from that grade school since we moved across the country 23 years ago. And I was one of the first people she looked up when she joined Facebook. It's always strange to think how our lives touch other people's. (7) I haven't mentioned it before, but I am going to Blissdom. I totally won't fit in, I'm sure, because I happen to be fashion incompetent and all, but I am looking forward to hanging out with the cool blogging women that will be there. Blissdom sounds like so much fun! Can't wait to hear about it. you looked like you fit in to me :) I could hardly take my eyes off you and that baby of yours who wouldn't stop cooing and making my .. umm.. yeah. Tingles. I feel like I've seen you somewhere before, perhaps a La Leche League parenting conference? Now that is a place you really look like you fit in! Did you attend any in Georgia? It's very hard for me to believe, but it has been half a year since this little one was born. She has a nasty habit of waking up around 1:30 in the morning and she's a much more vocal advocate of attachment parenting than I am, but her smiles have a way of brightening the room and making her mama, her daddy and all her siblings melt into a puddle. Oh so cute! just want to scoop her up and snuggle. That's one good looking Adams gal! When you see someone that precious and hold her in your arms, it's no wonder you get the urge to have another ;) . Don't know if that would help the saner existence plan from the previous post, though. It's good you've blocked time out for prayer, and I hope I can use you as an example for what I need to do as well. So sweet! Our littlest will be a yearling in less than a month!! He's waking up between 11 and 1, so she's already got him beat! So cute! She reminds me of her brother, P, in this picture. What happened to all that hair she was born with, anyway!?! Oh what a sweetie! Is she coming to Blissdom again? Because I know that I'll be missing my babe after a couple of hours. What a cutie! Happy half-year birthday, little person. "I can't take it any more." A young baby, homeschooling, housework, too many places to go, too many house guests and not enough sleep have been pitching me over the edge recently. I'd be in tears at the drop of a hat and saying the meanest things to my husband, who was frustrated by me and started suggesting it might be time to put the kids in school. Nothing seemed to be going well for me towards the end of last year. Putting the kids in school wasn't the answer I was looking for, but nothing seemed to be working. A friend reminded me of a book I'd flipped through in the past called A Mother's Rule of Life by Holly Pierlot, which seeks to help a woman in my position figure out how to put all the parts of her life into the proper order and find balance. My first thought generally is not to turn to self-help books or anything of the sort, but one gets to the point where one must do something. The author suggests not just writing a schedule willy-nilly, but actually considering one's vocation as a wife and mother and working to fit various important areas into ones day in the proper order of importance. I think the overall idea of the book isn't terribly new or different, and yet it addressed needs I'd been having of late better than other things I've run across. One idea that really struck a chord was that when one creates a scheduled plan, it gives one a lot of freedom to know that something will be done. You don't have to fret over getting everything finished all at once, because every job has its time and place. As I've seen myself alternate between staring at the walls not knowing what to do, but knowing I had a lot to accomplish or running around frantically trying to get everything done all at once, this idea of putting everything into its proper order in a scheme and knowing when something should be done (so that it actually gets done) appeals to me. Her schedule is not mine, but then again I am not her. In fact, I have yet to fix a complete schedule for myself. I have begun by making a few changes though. I've set aside a time to pray every day. Now while I am in the kitchen cooking dinner, I turn on my CD of the rosary, since I can't cook and hold beads at the same time (plus I really like the meditations by St. Therese). I also got my husband to sit down with me and help me write up a schedule for homeschooling. Not a schedule of specifically when to do what lesson, but a schedule of what lessons to try to get through in a day and I pulled out a three-ring notebook for each child with a section for each day of the week to put their readings, copywork and other similar assignments in so that when we get to something I am not fumbling around and asking them to hold on while I scan and print out work for them. Is my house clean and tidy and my day perfectly ordered? Sadly no. However, I feel like I may be making my way out of a cloud of depression and frustration. The next steps for me are creating a housekeeping plan of tasks I'd like to get done each day or week and figure out which children can help me with them and perhaps to line up a babysitter who can watch the kids once every few weeks for a few hours so that I can have a chance to be alone. You do have a full plate. ((HUG)) I didn't realize you were feeling this badly. I need to adopt some of that book, I think. I was thinking last night that I should make a list of things to do at certain times in the day and then check them off so I don't forget stuff and find myself scrambling. See, I don't know that I could even get started doing what you do, and I've only got three. Just last night I was telling my friend KYP that you're one of my heroes. For what that's worth! I'm glad you've got a plan. Praying for you! When you told me you were saying a Rosary while making dinner, I had to concede that you really are a far superior cook than I.
I couldn't figure out how you could do both at once without botching dinner. I have to lighten up the schoolwork first, keep the house reasonably tidy (that serves my mental health) and getting sleep is major. That's my problem....exhaustion. A nap in the afternoon, where I really close my eyes and doze seems to work wonders. In early days of motherhood, I found the Sidetracked Home Executives book helpful just for its list of various tasks that tend to keep a house looking a little more together. I think FlyLady has a similar 21st century approach. I'm working through The Power of Less right now and find its "simplify, simplify" approach helpful as I think about the three big priorities in my life right now. It has been hard to get on track with these things but I hope to have some success like you're having by breaking things down. I have said it before, but you are not only a brave, brave woman but a model for me. 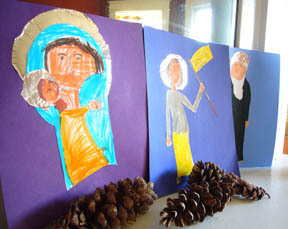 Homeschooling one preschooler while chasing a toddler has already begun to edge me toward finding a nice little private school somewhere (and then finding the money for what may well be a not-so-nice-or-little tuition). The mice in my house have reverted to a more normal Pinkie status and are less Brain-like. After the great disappointments of failed mice killing earlier, we managed to completely ignore the critters for several weeks. Until our dog parked himself firmly in the spot where I prepare dinner with his nose sniffing away madly under the cabinets. I still managed to ignore/step over him for one night, but when the mouse made a mad dash from his hide out, over my foot to another under cabinet location, I decided it was time to do something. We had hardly turned out the lights in the kitchen before we heard that pleasant snap meaning that there is an ex-mouse somewhere on the premises. 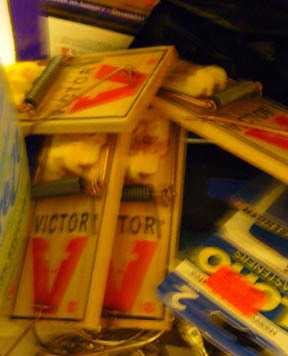 The dog had also been nosing around the foot of our bed and a cabinet in the schoolroom, so we put traps out there -- and hit the jackpot in all locations. I'm paying closer attention to the dog and where he's paying attention. It's not as good as a cat and I doubt we'll ever really win the war on mice, but it's a start. It helps to figure out where they're coming in and block access. When we lived in Illinois the mice would come crowding in after the fields were harvested. DH blocked every little hole he could find (gaps around pipes under sinks, etc.) with steel wool. That seems to do the trick; they can't eat through it. I have also had success with the steel wool trick. I'm just not sure there is enough steel wool in the world to plug all the cracks and crevices in this old house, but it sounds like it would be worth a try. You know those spiral notebooks that Wal-Mart and Target sell for $.10 at the beginning of the school year? One year when they were marked down to $.05 each, I bought about 40 of them. Of course, that year my mother-in-law also bought us a bunch and has done so every year since. 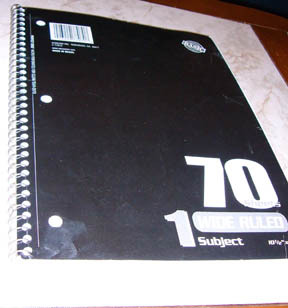 Even though my children inhale paper like air, we haven't managed to work through all the spiral notebooks in the house. At the beginning of the year, I decided to start doing something with some of the notebooks, besides the usual scribble-fest that fills most of them. 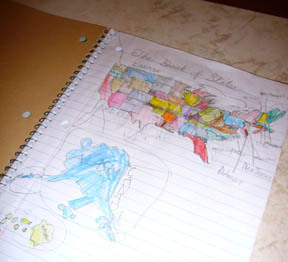 My oldest was also very into U.S. geography and so we decided to turn one of the notebooks into a study of the states. It's already bound. It's already lined. It's perfect. This has become a great geography/handwriting/art project and one my son looks forward to adding to. I think the fact that it is a special book helps, because he has a dedicated space, layout size, and ruled lines. Although one could certainly print out pictures for all the parts, since my son likes drawing, he's doing most of the illustrations himself, but I do print maps of the states for him from Houghton-Mifflin's Outline Maps. In my son's geography book, we started with a title page and illustration of the US, followed by a list of the states and the years they entered the Union. Then each state gets a page with facts about the state, a map showing its location in the US and a larger state map. On the back of that page, my son has been drawing copies of the state flags. This does lead to a little confusion because you wind up looking a the state information for one state and the state flag of the previous one, but it's a pretty good format. He's not quite finished with the original colonies, so this book will be an ongoing project for a long time to come, but it is one both of us our pleased with. I'm looking forward to making more books out of our excess spiral notebook collection. I'm thinking about a study of prayers and the sacraments, an book of artists and a tree identification notebook. Very cool! Did he do that US map freehand? That's excellent! I stockpile those notebooks as well, and we use them in similar fashion. My oldest likes to use them for "writing books." She writes stories and illustrates on the pages as she goes. It usually takes her a few weeks to finish a "book," but when she done, the book is already bound. Yes, Lenise, he did draw the US map freehand. He's really got a good eye for detail, in the opinion of his proud mama -- even if he's sloppy about other things at times. Great idea! I am going to copy your idea, if you don't mind. My dd will love doing this. Thanks for sharing. On the morning after Christmas, the six year old gently shook her father awake and announced that she had thrown up, but that it was all under control. She'd made it to the toilet and she was just letting us know. "Phew, did we get off easy," we thought. Hahahaha! Early, early that Sunday morning, the bug hit me and the two year old. Then it seemed that things were getting better, though one or two children had on and off diarrhea. We continued on with fairly normal life (meaning we probably infected tons of people, sorry about that), even going up to The Fathers of Mercy for Mass on New Year's Day. We came home, ate, watched The Great Race with the kidlets and had a nice lazy New Year's day. I was curled up and sleeping when the screaming started. The four year old had emptied the contents of her stomach onto the bed she shares with her sister. When my husband started cleaning up their bed and transferring the girls to separate locations, the six year old threw up all over her brother's bed and managed to shoot it under another bed. And by morning, there was yet another set of sheets covered in more of the same. That, if you are keeping score, is three sets of sheets/pillows/duvets/pajamas/etc. 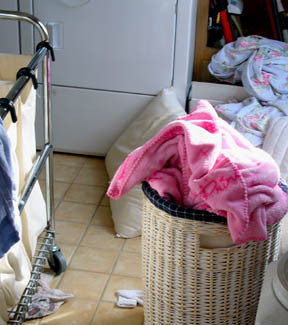 I had been caught up with laundry when I went to bed the first time and I loaded of the washing machine at midnight with the first load from the first attack of the plague of 2009 and got up at 7:30 to start a new load before doing anything else. The washer and dryer have been running continuously since then and if nothing else happens, I still have at least two more loads to wash. The year can only get better from here, right? I hope this is the only attack of germs this winter for you all - let it run through you now and leave, never to return. Or come back up, as the case may be. I'm just so sorry. All I can say is that I remember a wild stomach virus situation we had when we only had 3 kids. It must've been about 17 years ago (really dating myself here). That was AWFUL. It's not happened again since then. Just offering hope to you. And some prayers along the way. It's so hard to manage sometimes, isn't it? Well, you know you have my sympathies. Sometimes I think we spend more of our lives sick than healthy around here, ugh! This Christmas holiday is one of those times sadly, so I am sitting here feeling rather sorry for myself, and for you, you poor thing! But probably like you, I hate vomit-fests the most, and we have one less kid to add to the mix than you do! Here is hoping you will have a much healthier 2009 from here on out. I'm so sorry to hear it. 'Tis the season. So far, we've only had minor troubles- the littlest on antibiotics isn't bad compared to a vomitfest. Hang in there, and I'll pray for you all to be healthy soon!! I'm sorry to hear it. Praying for you all to return to health speedily! I guess the comments DID come through. Anyway, I hope everybody's well!